Are you looking for a web browser for Mac OS 8.6-9.2.2 (and compatible with 10.1.5-10.3.9)? Try our sister project, Classilla. and lay the foundation for future innovations. you use every day. It’s TenFourFox at its highest level yet. Ahoy. Your chip’s come in. So make the jump and keep your Power Mac relevant. Our software is open-source, written by Power Mac users and maintained by Power Mac users, incorporating our custom new PowerPC-only features plus the latest bug fixes, security improvements and all the powerful technology underlying Mozilla Firefox. ▶▶ Feature Parity Release 13 Security Parity Release 1 ("FPR13.1") is an urgent out-of-cycle security update. Are you up to date? ▶▶ If your browser is too old and can't establish a secure connection to the download server, try using the TenFourFox Downloader* to download the right version automatically (Power Macs only). Double-click the .zip file to decompress it, and move the application to your Applications folder. Problems? Ask questions and get help at our TenFourFox Tenderapp Support site. Please note: TenFourFox does not support Flash or Java (read why). Keep up with our progress and try beta versions on the TenFourFox Development blog! 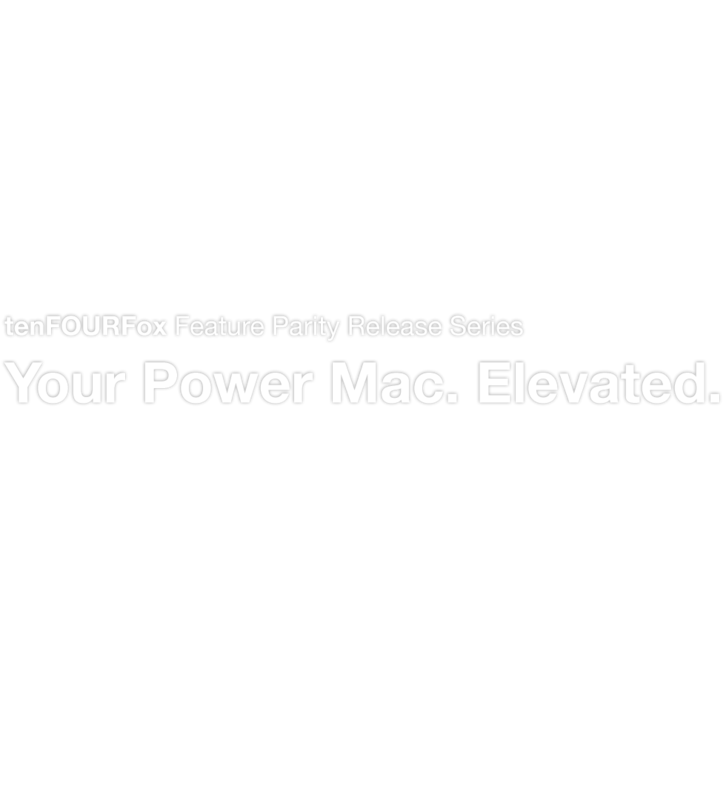 * The TenFourFox Downloader requires a Power Mac running 10.4 or 10.5. The Downloader will not operate on an Intel Mac. Although the Downloader uses current encryption methods to download the browser, the Downloader itself is accessed over unencrypted HTTP. If you are in an environment where your network may be tampered with, we recommend using another computer for the initial download or manually verifying the download with cryptographic hashes. TenFourFox is free software, "as is" without warranty of any kind, including merchantability or fitness for a particular purpose. There is always the risk of system instability, data loss or security compromise. You accept these conditions unconditionally by downloading and using TenFourFox. We eat our own dog food, but we (and you) do so at (y)our own risk. Find out more about the Mozilla Public License and other licenses governing this software. Intel-based Macintoshes are not supported. Selected older versions prior to 24.1 and after are available, but have known remotely exploitable security vulnerabilities, and you use them at your own risk. Please do not send support requests and reports by E-mail; due to the volume of mail received, not all requests can be answered or acknowledged. Um die deutsche Sprachunterstützung für TenFourFox FPR zu installieren, laden Sie diesen Installer herunter. Entpacken und doppelklicken Sie ihn, um die Installation zu starten. Para instalar el soporte español en TenFourFox FPR, descargue este instalador, descomprímalo, y de doble click al instalador para iniciar. Pour installer les ressources françaises dans TenFourFox FPR, télécharge l'installeur, dézippe le, et double-clique l'installeur pour commencer. TenFourFox parla la tua lingua. Per installare il supporto alla lingua italiana in TenFourFox FPR, scarica questo programma, decomprimilo e fai doppio click per iniziare. TenFourFox porozumiewa się w Twoim języku. Aby zainstalować wsparcie dla języka polskiego w TenFourFox FPR, pobierz instalator, rozpakuj go i uruchom aby rozpocząć instalację. TenFourFox говорит на Вашем языке. Для установки поддержки русского языка в TenFourFox FPR, загрузите этот установщик, распакуйте его zip-архив, и дважды щелкните по установщику для начала. Asentaaksesi suomen kielen tuen TenFourFox FPR, lataa asentaja, pura se ja tuplaklikkaa asentajaa aloittaaksesi. För att installera det Svenska språkpaketet till TenFourFox FPR, ladda hem installeraren, zippa upp den och dubbelklicka på installeraren för att komma igång. Copyright © 2010-2019 Contributors to TenFourFox. All rights reserved. Mozilla, Gecko and Mozilla Firefox are trademarks and/or registered trademarks of the Mozilla Foundation. TenFourFox is not an official Mozilla product and is not a Mozilla-maintained build of Firefox. The Deer Park Globe appears in the derivative works used in this product under the auspices of the Mozilla Public License. Flag images (except Asturian) are courtesy the IconDrawer. Copyright © 2010-2019 IconDrawer. All rights reserved. The TenFourFox "tiger fox" is copyright © 2010-2019 Cameron Kaiser and appears under a Creative Commons BY-NC-ND 3.0 license. All rights reserved. The image of the Sierra Nevada Conway Summit used above is copyright © 2010-2019 Cameron Kaiser and appears under a Creative Commons BY-NC-ND 3.0 license. All rights reserved. The Apple marks, Apple press images and Apple icons used in the spoof above remain the property of Apple, Inc., and appear here in the spirit of making fun of Intel Macs. Please don't sue us.